Ever wonder what the best garage floor coating is? So do we. In general, nobody really likes the look of a bare garage floor. On top of that they really take a beating. They get all scuffed up by your car’s tires. Right now big box stores like Home Depot and Lowes are cashing in on the latest flooring fad taking the country by storm. They are selling millions of units of DIY epoxy garage floor coating kits. There is a problem here though. These millions of units are low quality, even if they are easy to use. Don’t get us wrong, they look great. But their lower quality means that they last a whole lot less longer than stronger alternatives. So what are these stronger alternatives? We’re going to talk briefly about why the less expensive epoxy doesn’t last as long, what the professionals are using and what epoxies are best for homeowners who want to make their dollar last. The epoxy floor coating in North Scottsdale was made to withstand the elements present in your garage. For example your tires, gas, oil and much more. So believe us when we say that the thicker the epoxy coating the more life you will get our of your floors. To crunch some numbers here, a normal DIY epoxy kit sold at your local hardware store is going to have a film thickness of around 1.5 mils per coat as opposed to the professional product which would yield anywhere from 3.0 to 30 mils per coat. A remarkable difference that is crucial to the longevity of your epoxy floors 85255. Why do professional epoxy products go on so much heavier than the storebought option you ask? The answer lies in the amount of volume solids in each canister. Inside every can of coating is two base materials: solids and solvents. The solid is what remains on the surface once the solvent has evaporated, also known as dry paint film. The solvent is the liquid that makes it pourable, and is primarily the reason you’re able to get the product out of the can. Whenever the amount of solids by volume in your coating is higher this will make the paint thicker as film when it dries. On average, the store bought DIY kit contains around fifty percent volume solids, and the professional product contains between %65 – %100 solids by volume. This allows for a heavier wet film to be left behind which in turn allows for a very thick dry film to be used as your solid barrier. Everyone knows that preparing the painting surface before application is directly related to how long that paint will last. The same goes for North Scottsdale epoxy floors but times ten based on the amount of abuse the garage floor takes. In order to prepare your garage floor you need to scarify, or beat up the top surface. The reason you need to do this is that the more like sandpaper you make the surface the more the coating is going to have to “grab” on to. The problem here is that this is really only something a professional can do properly as the professional equipment needed is a diamond grinder or track blaster. But many times it just costs too much for the average homeowner to call on the professionals to do this job for them. Sometimes you may be able to acquire some tools for a rental facility, but we cannot stress enough that this work is better left to the professionals. The DIY kit manufacturer knows that an average homeowner is not going to be hiring professionals to do the job for them, and thereby knows that proper floor prep will not be done. In that light they offer a recommendation. Instead of using special tools you can just use acid etching. When you use the acid etching technique it basically melts away the top layer of the cement in your garage. This is meant to create a surface area for your epoxy flooring 85260 to hold on to. Unfortunately, even though it DOES create a light texture on the surface, it would not be enough to allow for the heavier epoxy to stick. You would have to use the lighter epoxies in order to have it “grab” on to the acid etched garage floor. And as we already talked about, using the DIY, lighter epoxy is not going to last as long. You can count on the professionals at Barefoot Surfaces to do the job right. 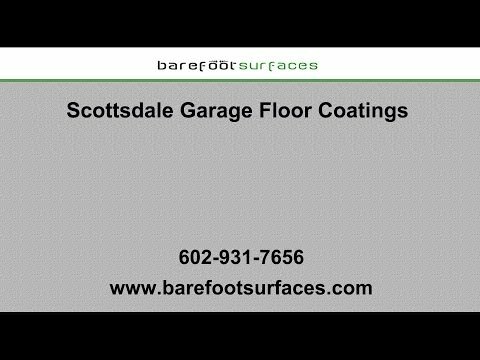 We can always answer any questions you have about outdoor epoxy flooring in Scottsdale as well as concrete garage floor coatings in Scottsdale. So don’t wait, contact us today!